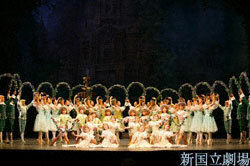 *Nina Ananiashvili , who is originally to perform the role of Princess Aurora, is unable to perform. Alternatively, Svetlana Zakharova is taking her place. Please refer to New National Theatre News. Available from Saturday 19 March, 2005 at 10:00am. *Centre balcony row 4 / Side balcony row 3-4 (¥3,150): Sold at the NNTT Box Office and all Ticket Pia outlets on the performance date only. Up to 2 tickets per person. No phone reservations. 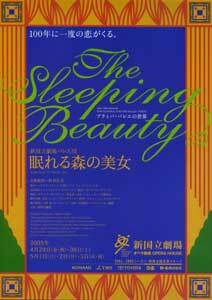 *Seat Z(¥1,500): Sold to students only at some Ticket Pia outlets on the day before the performance. Any tickets not sold by the performance date will be released to the general public at the NNTT Box Office and some Ticket Pia outlets. One ticket per person. No phone reservations. Students must bring a valid student ID. *Same day student tickets (50% off, except Centre balcony row 4 & Side balcony row 3-4 ): Sold at the NNTT Box Office and some Ticket Pia outlets on the performance date. One ticket per person. No phone reservations. Students must bring a valid student ID. Based on Perrault’s widely known fairy tale, The Sleeping Beauty is known for being the largest in scale among the three major ballets by Tchaikovsky.It is unparalleled in the variety of music, as well as the large number of characters and the lavish scenery, costumes, music and choreography. The story runs from the birth of Princess Aurora to her 100-year sleep and to her happy marriage with the ideal prince and is portrayed with dancing resembling a gorgeously colored ballet picture scroll.It is a masterpiece with dignity and stylistic beauty that makes it deserve to be called the high-water mark of 19th-century Russian ballet which flourished around Petipa. The Sleeping Beauty was first performed at the NNTT as part of the program to celebrate the grand opening of the theatre in the autumn of 1997, and its luxurious and splendid performance graced the inauguration of the theater.It has been well received every time it has been staged, and this season marks its fourth performance.Befitting the Golden Week holidays, four distinguished dancers, including a guest dancer from the Bolshoi Theatre, will dance as Princess Aurora, vying with one another in splendor.Supporting the beautiful Princess Aurora, the New National Theatre Ballet, which was honored with the Fourth Asahi Performing Arts Award, will deliver The Sleeping Beauty to you with all its heart.Please enjoy the charm of grand ballet to the fullest.